We are excited to offer on the sellers behalf the "Red Baron", the one and only Mercedes 600 lwb factory painted in signal red (568). This particular car has an extensive and quite interesting history file which includes ownership by prominent people as well as being used within the Hollywood Movie industry. The car has now travelled 90000km, about 56k miles and presents itself in stunning condition. Delivered in Germany reportedly for use by Charles Schulz, the Peanuts creator, in 1973 where legend is he toured Europe in it. The car was sent to the U.S. entering through Hollywood Mercedes. It was fitted with U.S. DOT items such as side marker lights, etc. 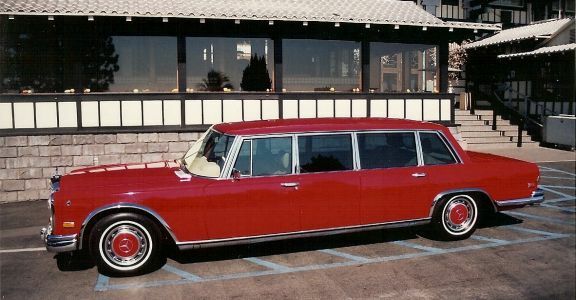 During Mr. Hiltons ownership, this car with driver was provided for use by 21 celebrity friends whenever they were guests at the Las Vegas Hilton. Some names you may recognize include: Elvis Presley, Henry Kissinger, Muhammad Ali & Jack Nicholson. Jack Nicholson later purchased his own Mercedes Benz Classic 600, Elvis even bought two of them! The car was purchased by the current owner in 1991, when it had approximately 64,000 KM on the clock ... or about 40000 miles and included the service records. In the course of its restoration, it was discovered the wood veneer is Macassar ebony, on the endangered species list, and now extinct. There are three different grain patterns used in the door & window garnish molding, dashboard and refrigerator and bar. The upholstery uses the correct pattern German leather in parchment with a light beige German wool velour carpeting. In 2002 the Red Baron was equipped with a custom DVD and CD - surround sound system. It provides an awesome entertainment experience that can make a 100 mile tour pass by in a flash. We are now looking for an enthusiastic keeper for this car, who will value and understand the importance and uniqueness of this special 600 and preserve it accordingly. We gladly arrange inspections for qualified buyers. The Red Baron ist a very unique collectors item. The right centerpiece for a truly defined collection. No other 600 has the exciting history of Hollywood and Las Vegas like this signal red Mercedes. Fantastic!